It all happened on August 1st. The protagonist woke up one morning to discover that she had lost all memory of anything before August 1st. She had no idea who she was, what life she had lead and her relationship with those around her. It was then when a young man who called himself a "spirit" appeared before her. Him and the protagonist headed for her place of work, "Meido no Hitsuji (Sheep of the Other World)." She proceeds to work whilst covering up the fact that she's an amnesiac. 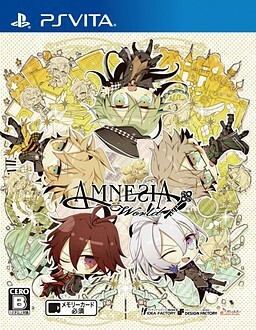 In Amnesia World, the theme is "Parallel Worlds". You're able to choose different "worlds" to play in after the prologue: the "School World", in which you're a normal high school girl, the "Music World", in which you work for a music company, and the "Criminal World", in which you work at a detective agency. Alternatively you can stay in the "Normal World", which is set in the "original" Amnesia world. Each world has a different atmosphere and gameplay. Oda KaoriOP "Tsuisou Canon" and ED "Kokoro Atata"
"I, Takayashiki Aoba, have no openings throughout my daily life!"